For this colourful, crunchy salad to be truly irresistible, use the best olive oil and some good quality bread. Cut the bread into 2cm cubes. Place in a shallow salad bowl and drizzle with 2 tablespoons of the olive oil. Stir well to allow the bread to soak up the olive oil. In a small bowl, mix the remaining olive oil with the vinegar, and season to taste. 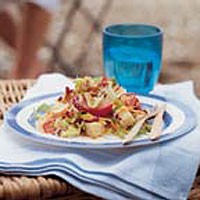 Add the lettuce, chicory, onion, carrots, tomatoes and celery to the salad bowl, then drizzle with the dressing and toss gently. Taste and adjust the seasoning, then serve immediately. You can prepare the salad ingredients earlier in the day. Don't dress the vegetables, just pack them loosely in a large, clean ziplock or freezer bag and chill until needed. Drizzle the bread with olive oil, cover the bowl with clingfilm and leave at room temperature until you are ready to make up the salad for serving. If raw onions are too strong for you, soak chopped onions in boiling water for 1 minute, drain, and use as above.